We’d love your help. Let us know what’s wrong with this preview of Gamer Army by Trent Reedy. After Rogan Webber levels up yet again on his favorite video game, Laser Viper, the world-famous creator of the game invites him to join the five best players in the country for an exclusive tournament. The gamers are flown to the tech mogul's headquarters, where they stay in luxury dorms and test out cutting edge virtual-reality gaming equipment, doing digital battle as p After Rogan Webber levels up yet again on his favorite video game, Laser Viper, the world-famous creator of the game invites him to join the five best players in the country for an exclusive tournament. The gamers are flown to the tech mogul's headquarters, where they stay in luxury dorms and test out cutting edge virtual-reality gaming equipment, doing digital battle as powerful fighting robots. It's the ultimate gaming experience. To ask other readers questions about Gamer Army, please sign up. Meme because, one minute old me, because. Is it sutibale forf younger children? Epic Gamer oF CouRSE iT IS, feLLow GaMEr! 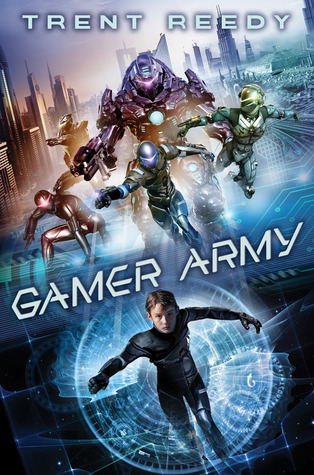 Gamer Army by Trent Reedy, 336 pages. Arthur A. Levine (Scholastic), DEC 2018. $17. Rogan and four other 12-year-olds have been recruited by the world’s most brilliant tech guru to participate in an elimination tournament in the Laser Viper game platform. The kids are isolated from their families and the world during the tournament and they never know when Gamer Army by Trent Reedy, 336 pages. Arthur A. Levine (Scholastic), DEC 2018. $17. Rogan and four other 12-year-olds have been recruited by the world’s most brilliant tech guru to participate in an elimination tournament in the Laser Viper game platform. The kids are isolated from their families and the world during the tournament and they never know when a challenge is coming. But they have access to the world’s coolest tech, which just keeps improving. What could go wrong? Well, maybe not al is as it seems with their idol. Or with the “missions” the kids are challenged to complete. Ride the wave of Ready Player One with this gaming tech-filled, action-packed treat. You might be able to pull hard-core gamers away from their computer screens long enough to read this! Any action fan will love it. Gamer Army is a cool, fun book to read. It was very surprising and had lots of action. I mostly read books with a lot of action. After Rogan levels up on his favorite video game, one of the most famous tech people invites him to a championship of his favorite game, Laser Viper. He goes up against four other competitors to be the grand champion. The virtual reality game feels totally real. Rogan starts out very excited and nervous, then he feels like something's wrong. Everything seems too real. T Gamer Army is a cool, fun book to read. It was very surprising and had lots of action. I mostly read books with a lot of action. The book was surprising because there were many important things that happen when you don't expect them. Because there are so many levels of the video game, there's lots of action scenes. It's exciting because if your character dies you're done, there's no second chances. There's lots of emotions in the book: sad, happy, excited, and nervous. What a great book! This is the 4th book I’ve read from this author...amazing! Cool science fiction book. I love the big plot twist! I love science fiction books that have a virtual reality game in them because there so futuristic and cool. If you love Ready Player One and Hunger Games, then you should read this. It has elements from both and is fantastic if you like adventure, action, and fantasy. This review has been hidden because it contains spoilers. To view it, click here. i really enjoyed this book, the story line is different from most books. Rogan is a gamer his favorite game Lazer Viper where he controls a Viper (robot) and fights on fireteams to defeat the scorpions. He is invited to a Lazer Viper tournament with 4 other of the worlds (Virtual and Real) greatest Lazer Viper gamers in their age division by on the world leading tech guru. they are shut out from the outside world no communicati i really enjoyed this book, the story line is different from most books. This review has been hidden because it contains spoilers. To view it, click here. I actually don't know when I started this. So I'm guessing the date down there. The beginning was pretty hard to get through. I kept putting it down and then taking forever to pick up again. I also had this feeling as I read the beginning that it just could have been written better. The climax of the climax. (view spoiler)[It was like, suddenly Rogan was self-destructing?? I just kind of had to reread it, I was so confused. I just wish that Reedy had taken like, even one sentence I actually don't know when I started this. So I'm guessing the date down there. Once, a character said bloody, and in an interview, it input [beep]. Those were the only language problems I had with this book, and while I certainly wasn't happy with them, there was a lot less than in some books. Unless you're bothered by character's saying crap, then there wasn't anything else. I eventually got to a place where I couldn't put down the book. At all. I had been sucked in by the story. The climax was super awesome! I actually got chills, and my jaw dropped more than once. I know that it's hard to write a good climax, but this was drawn out for just the right length, and led up to something actually big enough for all that suspense during the book. It also gave enough detail, which is something I was happy with. The suits! Were! So! Cool!! Also, I would totally be an Engineer. The friendships in this! There wasn't any romance going on. It was all like BUDDIESSSS! The video game references! Loved them. I've never read Ender's Game, but based on what I know of the book (and other reviews), Gamer Army was very much the same story. Set in the near future, almost everyone does most everything online. Work, play, socialize. Videogames are of course very popular. A company picks the top gamers in the world (in a certain age bracket -- kids) to enter a competition. I was enjoying the story that far. I didn't like the main character, but I liked the story's setting, so I kept going. Then things took a l I've never read Ender's Game, but based on what I know of the book (and other reviews), Gamer Army was very much the same story. Spoiler: Of course the company turned out to be evil. The game wasn't a game, it was *gasp* real! They were training the kids to be a military force. Then, even wore, those same kids helped take the company down. Sorry, but I do not believe a bunch of preteens, no matter how good gamers they are, could take down a whole massive, evil company. End spoiler. My younger brother picked this one out from the school library--I think he was simply drawn to the cover's promise of an action-packed book about video games. I have been helping him with some school things, and said that I would read the book aloud to him. The result was that we both got to enjoy an excellent book by Trent Reedy. Gamer Army caters nicely to its intended audience of young readers--language, violence, sexual content, etc. is all kept at a very safe level for young readers. There's My younger brother picked this one out from the school library--I think he was simply drawn to the cover's promise of an action-packed book about video games. I have been helping him with some school things, and said that I would read the book aloud to him. The result was that we both got to enjoy an excellent book by Trent Reedy. Gamer Army caters nicely to its intended audience of young readers--language, violence, sexual content, etc. is all kept at a very safe level for young readers. There's nothing in here that I found objectionable for even the youngest bookworm. That being said, the book still delivered strong and dynamic characters, surprising twists, solid action, and a satisfying conclusion. I will admit that, as someone who has read some of the more popular sci-fi stories, there were some elements of the story I was able to predict long before they occurred. The redeeming aspect in this regard is that there were surprises within surprises, so that although I may have correctly guessed at some aspects, others came as welcome surprises. This futuristic sci-fi thriller was full of unexpected twists and turns. This society partially revolves around new technology that has been developed to completely change not only the gaming world but also many other elements of people’s lives. These upgrades have allowed Rogan Webber to become extremely good at VR gaming. Rogan’s skills have caught the attention a very important figure in both the real and the virtual worlds, William J. Culum, the inventor of the technology that allows for the This futuristic sci-fi thriller was full of unexpected twists and turns. This society partially revolves around new technology that has been developed to completely change not only the gaming world but also many other elements of people’s lives. These upgrades have allowed Rogan Webber to become extremely good at VR gaming. Rogan’s skills have caught the attention a very important figure in both the real and the virtual worlds, William J. Culum, the inventor of the technology that allows for the virtual world to exist. Culum asks Rogan to compete in a contest in Rogan’s favorite game, Laser Viper. This contest seems like a great experience at the onset, but as it goes on the events occurring become more and more suspicious and worrying to Rogan and his competitors. This book’s intense range of action and suspense make this book a great pick for fans of sci-fi, and fantasy novels. This novel was very good, and I would recommend it to anyone that enjoys fiction books in general. This review has been hidden because it contains spoilers. To view it, click here. A blend between Enders game and Ready Player One. I’m not the target audience but it was a fairly ok read. I thought some of the foundation for the plot didn’t make much sense, but I think any middle school aged kid who’s into video games and sci-fi would like this. I’m not a big gamer, so a lot of this went over my head. However it’s a good story about virtual realty that gets a little too real. This would be a great book for middle grade boys who are into gaming and don’t like reading. I think that the theme of the book was that too much technology is bad for you. In the book rogan's parents didn't spend much time with him because they were always busy with technology. This was an interesting book. My son actually borrowed it from the library and I decided to read it before he sent it back. The author definitely has an understanding of gaming. Asher (12yo) read. "Really good book. Wish we had that advanced VR now. Also, the Laser Vipers are very cool in their different skill sets." Really nice book. Very interesting. It feels like a cross between Ender's Game and Warcross. Some of it is a bit obvious in what is happening, but a fun read nonetheless. Well written, lots of action. Character development was great and I loved how friendships and family were valued. I wonder if the concepts are a little over the heads of the target audience? Great! Very similar to "Ready Player One", but not quite as good. Still, I'd go see the movie if it was made. WarCross meets Phantom Wheel (or Ender's Game). Nothing special. I was reading this book for my Teachers as Readers book club. I just couldn’t get into it. I am not a gamer and do not understand any of the lingo. I think middle grade gamers would like this.